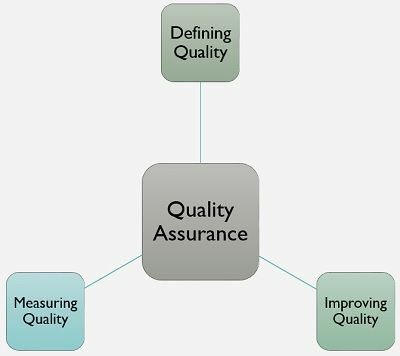 Definition: Quality Assurance is a managerial tool that encompasses all the systematic actions required for providing sufficient confidence, that a product will meet the requisite quality. Here, the confidence is bifold, as in internally to the company’s management and externally to the stakeholders such as customers, creditors, clients, society, government agencies, third parties, etc. Altogether, quality assurance is a process of preventing faults, losses, wastes and defects in manufactured products. Well, it is concerned with the way a process is performed or the product is developed. It focuses on planning, implementing, evaluating, and complying with the standards that are needed to assure quality in the products. For this purpose, a quality management team is created who are accountable for reporting the quality standards and incidents to the quality management department at periodic intervals. Fit for purpose: According to this principle, the product should fit the desired purpose, i.e. the product should serve the objective for which it has been developed. Right first time: As per this convention, the product developed must be free from any defects, when it is created. It is also termed as a zero defect approach. Take the necessary steps to reduce the causes. Eliminate recurrence of the non-compliance in future. The quality assurance is a proactive process wherein quality is created at the initial stage, i.e. when the product is designed, to ensure that the product satisfies the required standards and customer specifications. It assumes that it is the product design and process, in which the quality can be integrated into the product rather than the detection mode. Complexity of the end product. Number of processes through which a product passes. Quality Assurance is not an independent process, indeed it comes under the quality management system, popularly known as Total Quality Management. It entails, internal control system, compliance audits, process controls, training and employee engagement at each stage of production.